Address: Rua Pinheiro Chagas nº 46, Coimbra (Región Centro), Portugal. BE Flashpackers Hostel is located in Coimbra downtown, 1.5 km from the Sé Cathedral of Coimbra. Free WiFi access and a shared kitchen are available in this Coimbra hostel. 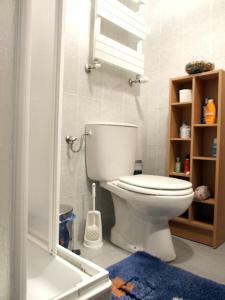 Each room has its own private bathroom, in addition to a desk. Bed and bath linen are included. Guests can use the shared facilities available, from the kitchen to the lounge area. The BE Flashpackers Hostel has a terrace, where guests can prepare barbecues and enjoy their meals when days are sunny. The hostel has luggage storage, and laundry facilities are available. The City Park is less than 15 minutes’ walking, and the Mondego riverside area is 10 minutes’ driving. Coimbra Train Station is 2 km away. Please note that there is a shuttle service available to the bus station and the railway station, at an extra cost of EUR 5 per journey. Please note that a EUR 15 deposit is required on arrival for towels and linen. The deposit is refunded upon check-out. Please inform BE Flashpackers Hostel in advance of your expected arrival time. You can use the Special Requests box when booking, or contact the property directly with the contact details provided in your confirmation.